Whether you prefer a high-end French bistro or classic burger joint, it can be hard to reign in your appetite when you’re out to eat. Unlike grocery stores, where most packaged goods come with detailed nutritional information, caloric content in restaurants often remains a mystery. If you’re on a diet or simply concerned with staying healthy, going out to eat can be a challenge. But there’s no need to call it quits with all eateries; you can stay on track while also indulging in your favorite cuisine. Many sauces, glazes, and spreads are chock-full of fat and calories — especially condiments that are fat or oil-based, like mayonnaise or ranch dressing. Even seemingly harmless condiments like ketchup, which is low in fat and carbohydrates, can be high in other damaging ingredients like sugar and salt. Your best bet is to use condiments sparingly and avoid dishes with heavy, cream-based sauces. When perusing menu items, the focus is usually on the food. But don’t forget to choose your beverages wisely, as well. Popular drinks like soda and juice contain a staggering amount of added sugar, which the body has a hard time processing properly. Fruit juice and soda contain fructose. Unlike glucose, which the body uses as fuel, fructose gets processed in the liver as fat, increasing your risk for developing conditions like diabetes and cardiovascular disease. Instead, choose a calorie-free beverage like water or unsweetened tea. Although French fries are a sandwich’s best friend, they are not the best option to pair with your entrée if you’re trying to stick to a healthy diet. In fact, a medium serving of fries alone clocks in at over 400 calories! Side dishes often fly under the radar because they’re small and generally viewed as harmless additions to a main meal. Yet fried foods like fries, onion rings, and mozzarella sticks can pack a significant caloric punch on their own, let alone as a side to an even bigger meal. When given the choice, go for options like roasted veggies, fruit, or a side salad to cut down on the fat and empty calories while still enjoying a full, well-balanced meal. Restaurants are notorious for piling a lot on your plate, often doubling or even tripling what is considered an average serving size. Oversized restaurant portions also have the potential to distort what we see as “normal,” which affects how much we eat at home, too. Given that large portions are one of the chief contributors to rising rates of obesity among adults and children in the U.S., it is important to be mindful of how much food you consume at each meal. When served too much food, most people will eat it anyway, even if they become satiated long before their plates are empty. Combat this common problem by eating slowly and consciously — studies show that the faster we eat, the less time we give our bodies to register fullness. Focus on the food, drink between bites, and don’t be afraid to leave some food on the plate. A little willpower goes a long way. Plus, who doesn’t love leftovers? Regardless of your cuisine preferences, most restaurants offer options for health-conscious consumers. 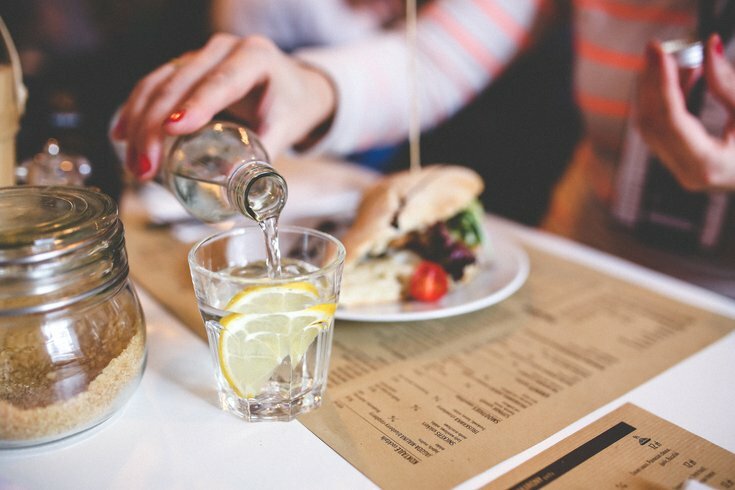 By sticking to a plan that involves sensible portion control and cutting out “extras” like condiments, fatty sides, and sugary drinks, you can stay on track even when dining at your favorite restaurant. Bon Appetit!